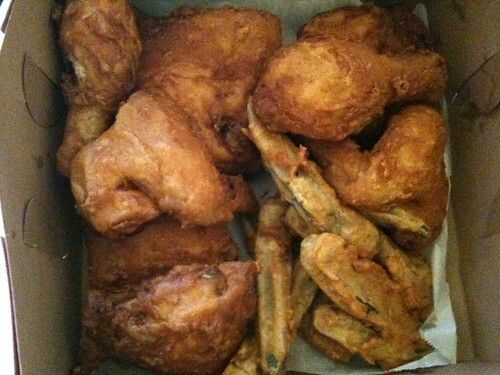 Fast Food – O Hei There! On our way back from Alex’s ranch, we stopped in Kettleman City once again. 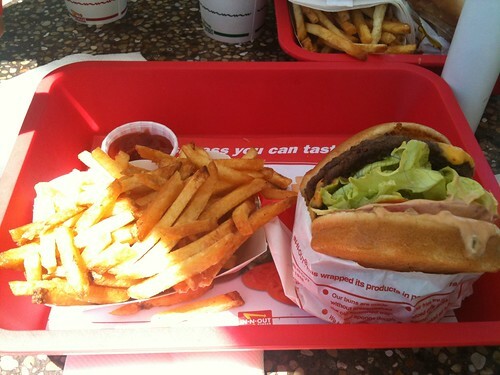 I wouldn’t have minded having In-N-Out once again, but the other guys wanted to have something different. So between Carl’s Jr and McDonald’s (don’t remember what other places were there), Carl’s Jr is definitely the choice. My rank for burgers at national fast food restaurants goes something like this: Carl’s Jr > Jack in the Box > Wendy’s > Burger King > McDonald’s. Of course, this is all relative. I never eat at any of these places nowadays, as I believe my palate to be above such institutions. 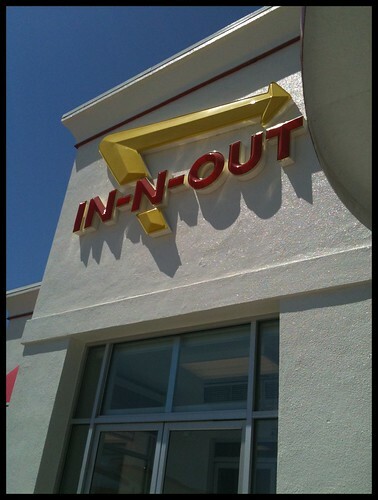 Plus, I have In-N-Out nearby. 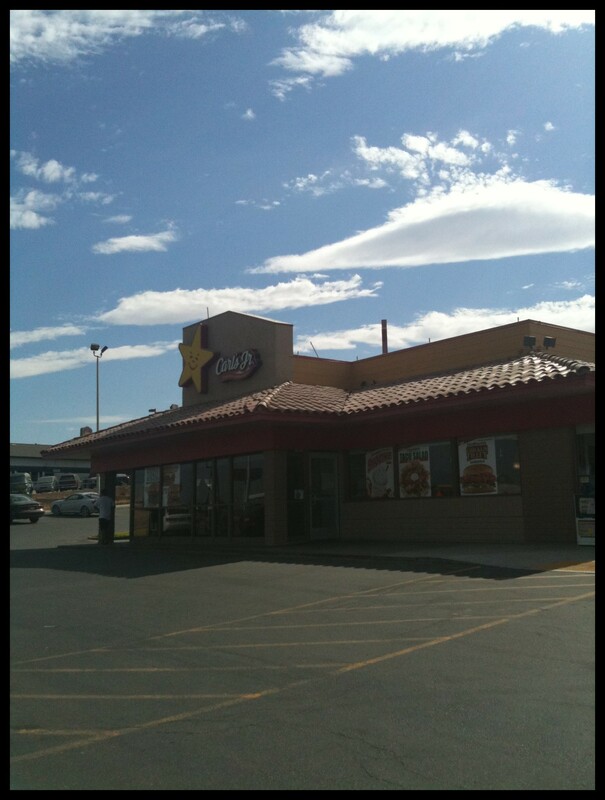 But there was a time when I loved Carl’s Jr. I used to live near one when I was in high school, and went there on my way home on a weekly basis. And when one opened on the UCLA campus during my last quarter there, I went quite frequently as well. So why the fallout, Chris? Well, once you’ve had never-frozen burgers like In-N-Out and the various gourmet burger joints in LA, you can never go back. 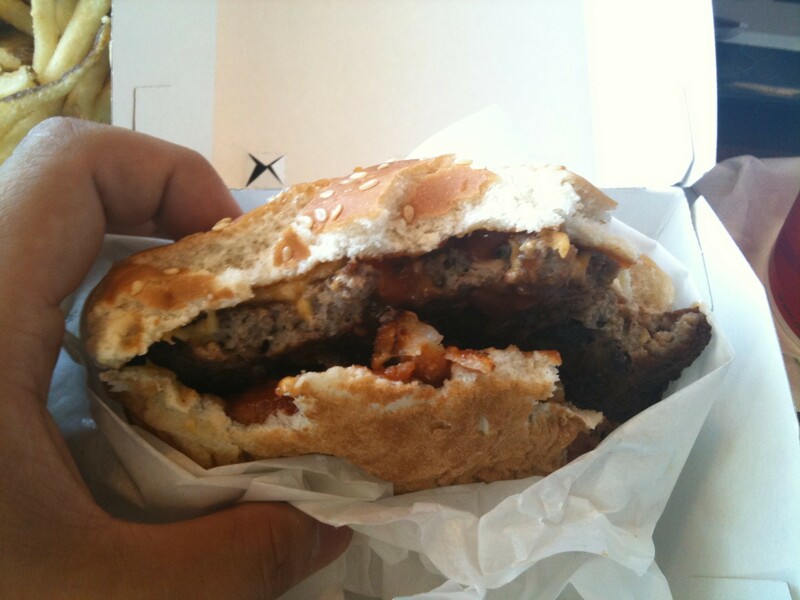 Still, out of all the national fast food burger patties, the burger patty at Carl’s Jr is by far the juiciest (not saying much – look at the photo above) and had a good char. I got the Western Six Dollar burger, which has cheese, onion rings and BBQ sauce. Decent burger. 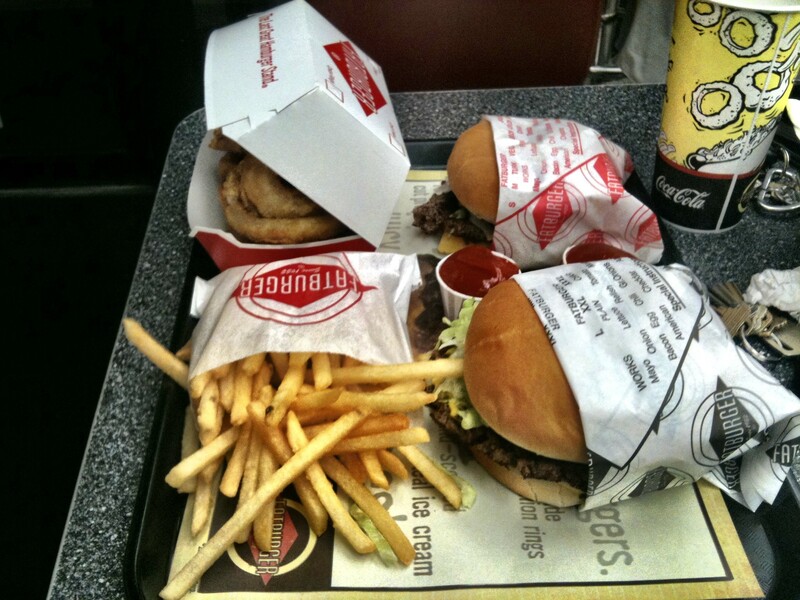 Used to be my second favorite burger back in my younger days (behind the Double-Double). 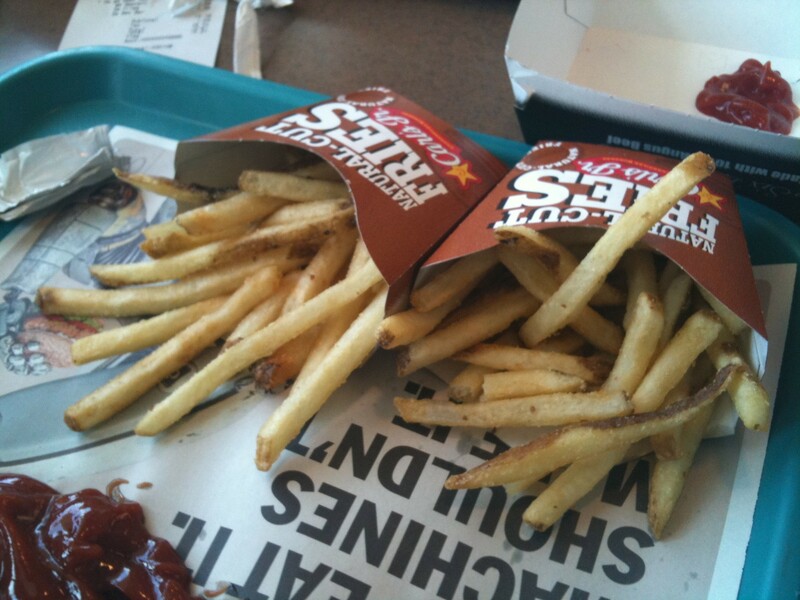 Fries were decent as well, but can’t compare to the ones at McDonald’s. Nowadays, I can’t bring myself to giving Carl’s Jr anything above a C. But come 3am and a craving for burgers, don’t be surprised to see me at the drive-thru. 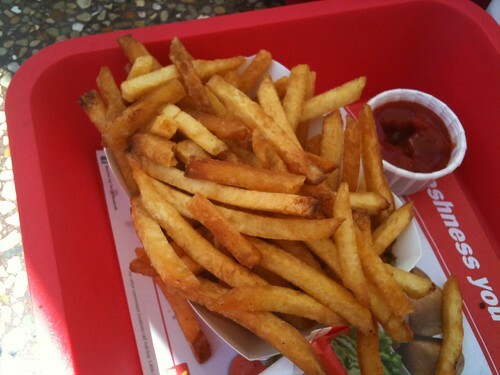 Besides my work and my apartment, In-N-Out is probably the place I visit most often. 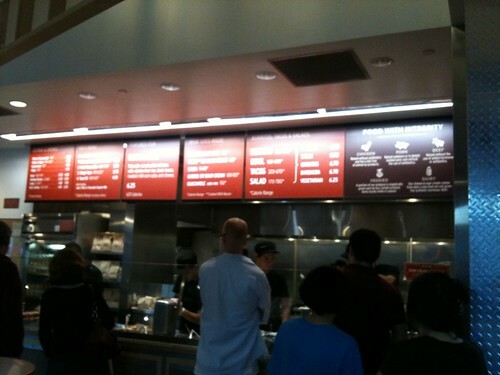 There is one near my apartment, and my fatass orders drive-thru at least twice a month. 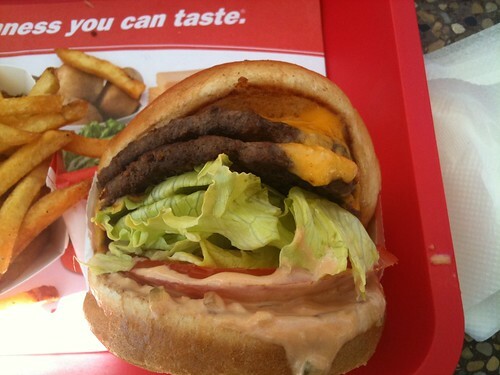 However, I haven’t reviewed it yet because I haven’t actually ate at an In-N-Out in almost two years. 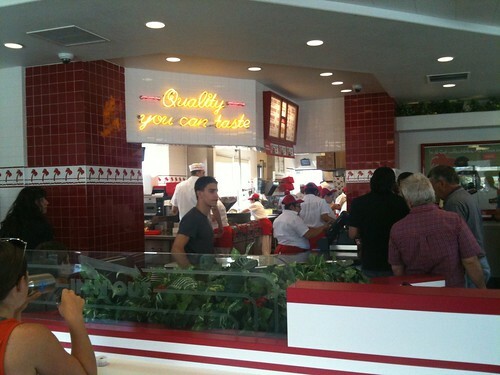 But taking a lunch break on our way to Alex’s house in Mountain View in Kettleman City (the halfway point between LA and SF), it was the perfect opportunity to dine in at In-N-Out and have it eligible for review, not to mention that there were no other feasible options. Alex, Linh-Nam and Ben waiting for the food. I usually order a double-double animal style (pickles, extra spread, grilled onions, and mustard fried onto each meat patty in addition to the standard fixings) or with whole grilled onions, and fries well-done. On this particular visit I decided to get the double-double without any gimmicks, to show what it looks like as is (although I had to get the fries well still – the regular version is a bit too…raw for my taste). The patties are more on the medium-well side (only at In-N-Out will I happily accept any burger/steak over medium-rare), but are still quite juicy, and certainly tasty. 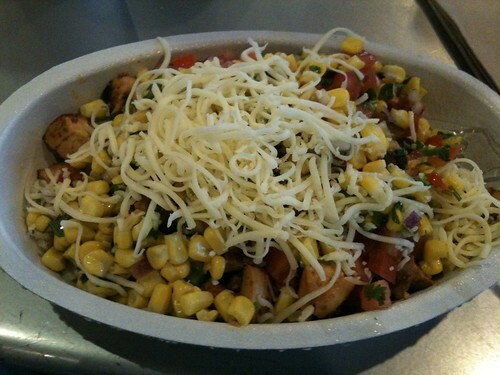 The cheese is an awesome melted mess. And the sauce, toasted bun, and veggies all go together harmoniously. This is still the king of burgers in my opinion. 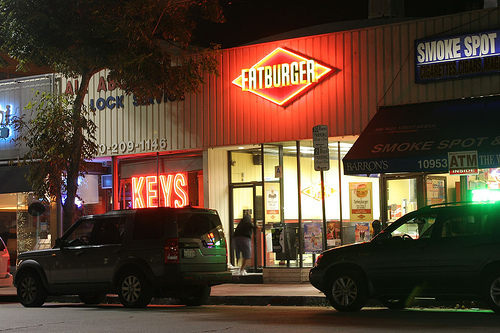 Despite the rise of gourmet burger joints, particularly in LA, no fancy-schmancy-over-$10-burger can match the pure satisfaction that an In-N-Out burger can provide. 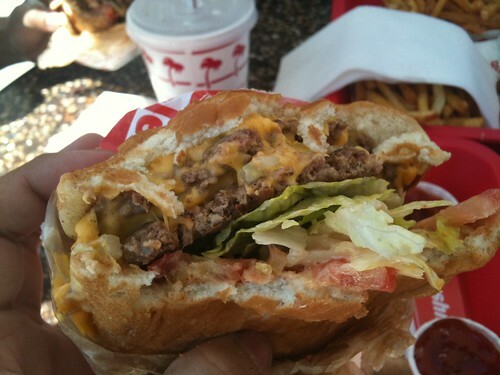 And unlike those gourmet places, the burgers at In-N-Out are as good as it can be on every single visit.